Maverick 7 v2™ is an all-season fat bike capable of handling some of the rowdiest trails around. It rides like a modern trail bike, but with much more confidence, traction, and versatility. Maverick 7 v2™ is an all-season fat bike capable of handling some of the rowdiest trails around. It rides like a modern trail bike, but with much more confidence, traction, and versatility. Combine the bombproof American-made aluminum frame with the Box Two drivetrain and Wren Inverted Suspension fork and you’ll have the most rad fat bike around. If you are looking for a bike that you can ride year round, but don’t want to miss out on the fun of riding in the snow, then the Maverick 7 v2 is designed for you. The progressive frame geometry is optimized to keep you feeling confident in the steep downhill sections and allow you to climb like a mountain goat on those daunting hills. Ultimately, this bike is designed to have fun no matter where or when you ride. The Maverick 7 v2 American-made frame is the heart and soul of the bike. The low bottom bracket, longer reach, and optimized chainstay length places the rider in the center of the frame creating a better weight balance between the tires patches, which improves cornering, grip, and control. 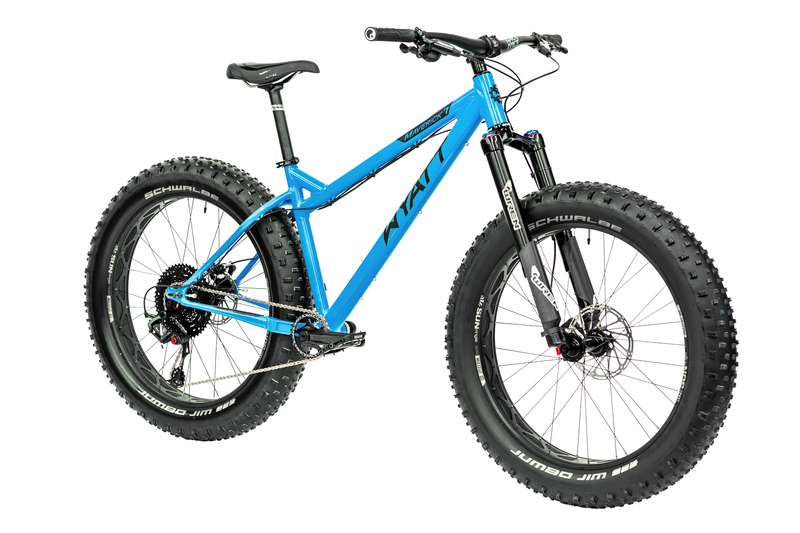 The rear triangle is one of many features that sets the Maverick apart from fat bikes. It has a CNC’d chain stay and seat stay yoke mated to rectangular tubing purposefully designed for added strength and stiffness for optimum power transfer and control. The progressive geometry allows the Maverick 7 v2 to handle like your favorite hardtail, instills confidence, and lets you focus on having fun! The incredibly strong CNC machined chainstay and seat stay yokes along with the rectangular tubing significantly enhances bottom bracket stiffness and increases power transfer when pushing on the crank. It also has enough clearance for larger chainrings and tires up to 5″ wide. The 120mm Wren Inverted Suspension is super responsive and tuneable. The Box Two X-wide range drivetrain shifts like a dream and can handle any hill that you encounter. The lightweight 40mm Wren stem and 45mm fork offset is a perfect combination that gives the Maverick extremely responsive handling and control. Every Wyatt bicycle comes with a limited lifetime frame warranty. If your frame fails during it’s recommended use, we’ll replace it. If the frame has a manufacturing defect, we’ll replace it. You can learn more here. Purchase a new Wyatt bicycle with Box components and you’ll receive a lifetime warranty. If a Box component breaks or cracks, they’ll replace it. If the Box component has a manufacturing defect, they’ll replace it. You can learn more here. Pay for your bike over time with monthly payments from Affirm. Our factory direct business model removes the middleman and retail markup from the supply chain, which allows us to manufacture high-end mountain bikes in the USA and sell them at competitive prices. All of our bikes are sold exclusively through our website and factory showroom.